They were recently announced as one of the 16 bands invited to play the T Break stage at this year’s T in the Park, festival. 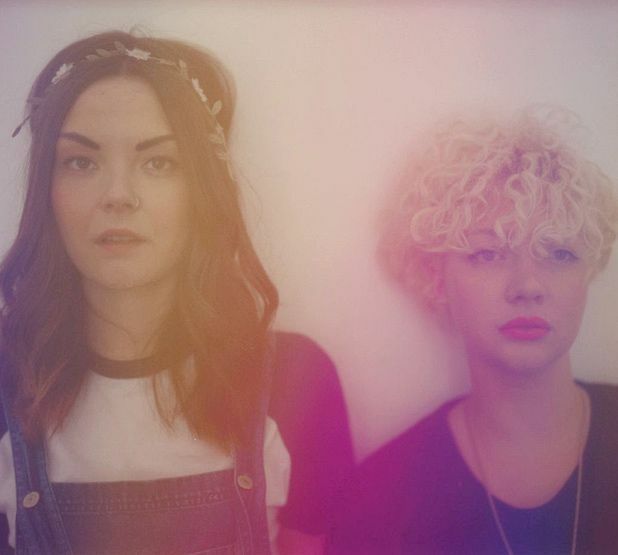 Their scattering of songs has trickled onto the internet stealthily but surely during the last twelve months, and hunger pangs have been heard online for the band's debut album – although those ravenous will have to wait until August before they are served up Honeyblood's first LP. A belated happy birthday - Honeyblood is now in its teenage years (if we’re counting in months). Any adolescent dramas or strops been thrown yet? Loads! We are so stroppy. But we're a happy pair! You've been getting The List excited ever since we unearthed your demo last year. You've had a busy year, supporting Mazes, Deap Vally, Sleigh Bells, plus playing the Vice party and The List’s first Breakout night. There's been a lot of buzz about the band, topped off with a SAMAs nomination, and now a T Break spot. What’s been the highlight so far? We’re not long back from playing our first show abroad at Tallinn Music Week. That was definitely a highlight. In the UK, it has to be our headline show at King Tut’s during New Year's Revolution. We got to play new songs at that show, and it was nice to see that a few people came to support us. Sleigh Bells was our first big support so that was a huge step for us. Also, we became pals with PINS and Mazes after we gigged them so those shows were really fun too. Stina, with Honeyblood’s sound, your Boycotts days seem far behind you. Obviously, as an artist, you evolve and embrace new music and influences as time passes, but what happened for the Honeyblood sound to materialise? Honeyblood has been materialising since I was thirteen. I got my first guitar at 12 and was writing my own songs in a teenage girl/boy band in the vein of Hole, L7, Babes in Toyland etc until my mid-teens. When I moved to Glasgow, I wanted to start a new band and formed Boycotts. I had a lot less control over the music because I never once wrote a guitar part. I guess, it was Boycotts that was the evolution and Honeyblood had always been there. I think our main influences are really obvious. For example, The Breeders, PJ Harvey, Best Coast... and someone recently said we reminded her of Rilo Kiley which made my day. I have such a crush on Jenny Lewis. The early Honeyblood tracks were heavy in distortion, and since then, you’ve forged a more distinctive sound, with your vocals more pronounced and lucid. Can we expect your vocals to be static-laden on any new tracks? We did the tape that way because we didn't really have any other way to do it. It was a fluke! The whole thing just worked out okay, which I love. It was a jam in a bathroom that we pressed play to. Mini fact/ tenuous link: Christina is the Latin feminine form of Christian. If you had to worship someone, who would it be and why? I'm not religious, but I do have a favourite Saint Kateri Tekawitha, also known as Lily of The Mohawks. She was canonised last year which made me really happy. I guess I'd probably say Kate Bush if I had to worship someone, she's heavenly. Your recent activity has shown you've been quite supportive of women's rights, reiterating and embracing the importance of femininity. Do you feel that gender is still a massive issue in the UK today? I'm glad that Honeyblood can support women's rights in a positive way. I think from a musician's point of view, my experience from being in Boycotts and then picking up a guitar and playing in Honeyblood have shaped my views on the attitudes towards female performers. I have always stated that we're two girls who play loud music, because we are and that's what we do. If so, does this come through in any of the songs? I think 'Super Rat' may have given people an opinion on how we feel about that sort of thing, but never once do I mention in that song that the 'rat' is a guy. We have a song called 'Choker' which is based on a short story by Angela Carter called ‘The Bloody Chamber’. Carter was known as a feminist writer. Yeah, 'Super Rat' doesn’t pull any punches whatsoever, does it? Yikes. What would make us get on the bad side of you girls? A creative industries festival showcasing some of the best emerging Scottish talent. Featuring live concerts, film screenings, flash craft, fashion, talks and seminars, and much more. This year's line-up includes Adopted as Holograph, Deathcats, Roman Noise, The Hazy Janes, Vasa, and many more.